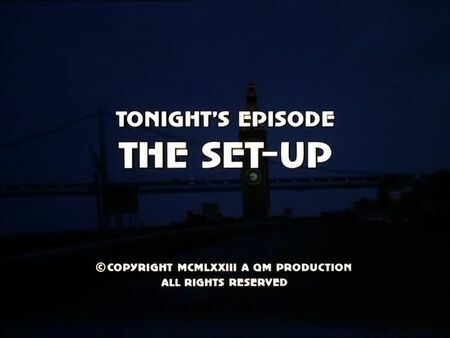 I have added the screencaps for The Set-Up to the episodes' section. Again, a little more focus on the main guest character in this episode, and again, it's done very well. A hit-man returns from Europe, recalled for one last hit. Appearances can be deceptive however, and we find out that this man's life has totally changed, and the mobster who called him back may not have the motivations he claims. Steve and Mike work the case, but we as viewers get a lot more insight than they into the hitman's character and situation. In this episode, we are taken to various locations throughout the city. The opening sequence was filmed at San Quentin prison, and subsequently the inmate who was almost assassinated is taken in protective custody at a site named Clover Leaf Rest Home (I am still trying to find out whether this was a fake sign or not). The former hit-man arrives at San Francisco International Airport and takes a shabby transient hotel room in Chinatown. Several sequences were filmed in the Tenderloin, at Leavenworth and Turk, where Mike and Steve are shading a bar owner and former member of the mob. Filming locations also include one of the mansions on Marina Boulevard (just for indoor filming), the Palace of Fine Arts, San Francisco General Hospital, Aquatic Park, and the Embarcadero, just south of the Ferry Terminal and right beneath the elevated Embarcadero Freeway.